I have been really trying to keep positive about changing my diet, but this weekend, I took a trip down self-pity lane. After a few weeks with no soy, I took my chance on a soy coffee, since soy came up as a mild intolerance. I haven’t had coffee in weeks, and I loved every sip of that caffeinated liquid gold…. until I started reacting to it and felt awful. That started off a bad case of the sulks. I wanted comfort food badly, and everything I wanted, I couldn’t have. I never thought a schnitzel could save the day, but a few bites into that crispy fried chicken goodness and all was right in the world again. It was exactly what I was after. I was so happy, you would never guess it wasn’t dipped in flour, egg, milk and coated in breadcrumbs, there was no difference in taste at all, the chicken was juicy and the rice crumbs nice and crunchy. I think I like the coleslaw even more this way, than with mayo; it was lighter and didn’t over-power the fresh taste of the vegetables. And with that I put my violin back in its case. 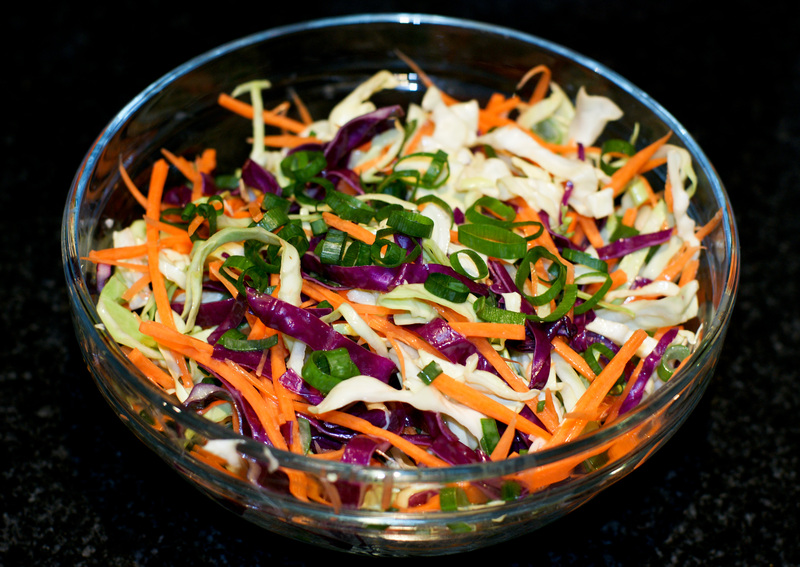 In a large bowl, combine cabbage, carrot & shallots. Add enough Nando’s Garlic Sauce to lightly coat all the vegetables. Put to the side. 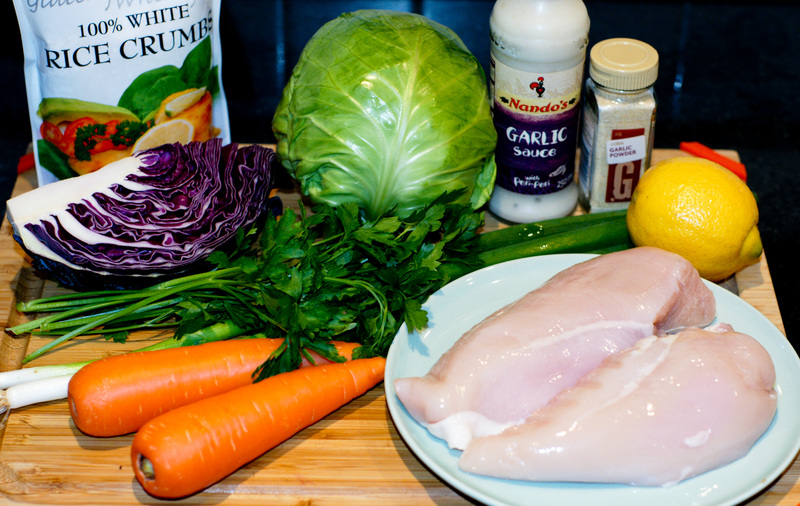 Slice each chicken breast in half, horizontally. 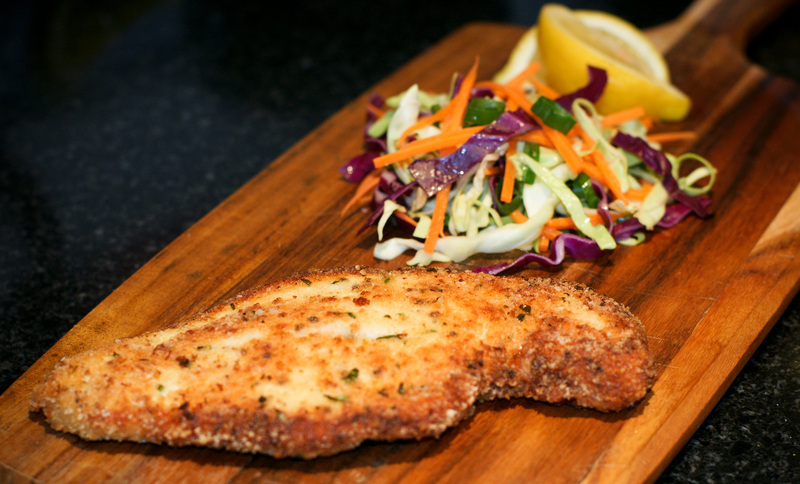 Using a meat hammer, bang each piece of chicken until the chicken is all the same thickness. In a bowl, add rice milk. Put aside. On a large plate, add the flour and season with salt and pepper. Thoroughly mix, and then put aside. In another bowl, add rice crumbs, lemon zest, parsley & garlic powder. Mix through. Take first piece of chicken, coat in flour mixture until completely covered. 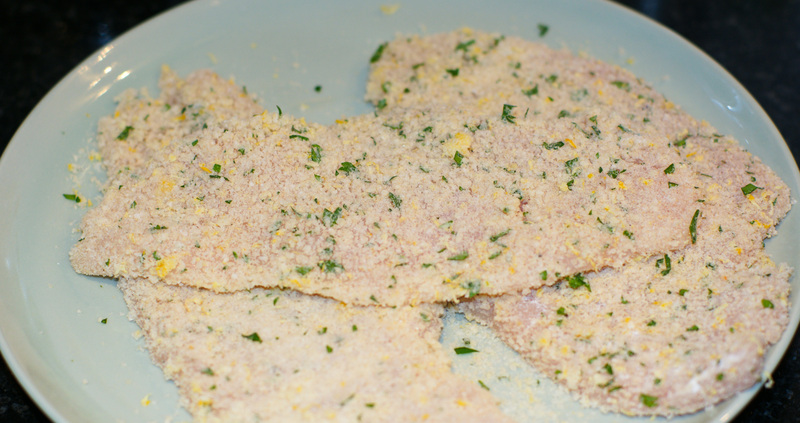 Then dunk into rice milk, then into the crumb mixture, pressing crumbs into the chicken. Continue with remaining chicken. Heat oil in frypan over a medium/low heat, add chicken in batches and cook until golden on each side. You need to be gentle with the chicken when turning. Always check the ingredients list of the products you are using for yourself. Nando’s Garlic sauce is GDES&N free, but made in a facility that also processes product with gluten, wheat, eggs, milk, tree nuts, peanuts, soya, sesame seeds and their derivatives. That looks really good! You should open up a gluten free restaurant. 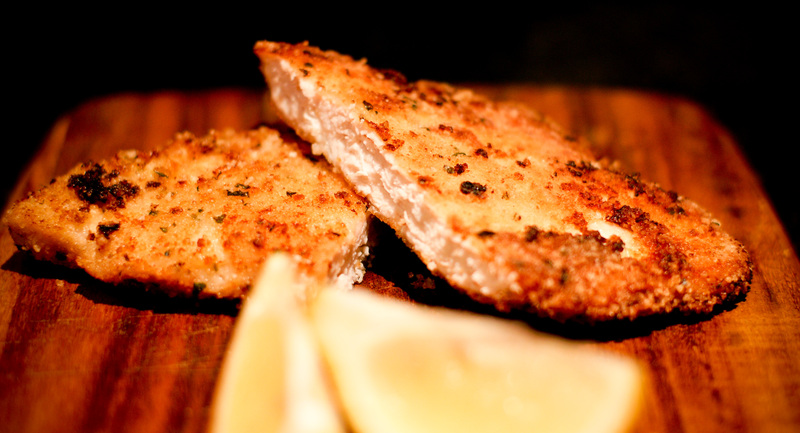 How different does rice crumbs taste from bread crumbs? Thank you 🙂 The rice crumbs were really good, they were crispy but still light. My husband had no idea they were made any different to normal. That’s awesome. My husband likes breaded chicken, but I didn’t know an alternative way to do that. Thanks for the wonderful tip!